Wednesday – Saturday at 7:30 pm. Directed by Jim Niesen, translated by Mark Ravenhill. 85 South Oxford Street, Brooklyn, New York City. This quotation from "The Life of Galileo” by Bertolt Brecht, which is enjoying a fresh, innovative production by Irondale Ensemble, could have been written yesterday instead of 1938. There are other lines that resonate. They create uncomfortable parallels between the Inquisition that eventually forced the astronomer to recant his discoveries; the rise of Hitler in Europe; and contemporary politics. The genius of Irondale Ensemble is their understanding of Brecht the iconoclastic artist, the showman, the jokester, the craftsman who loved to interrupt a scene with song. 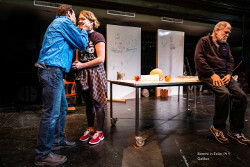 Although his plays speak out against any institution that limits freedom of thought, Brecht can break your heart with the human dilemma – as he does in "Galileo.” Irondale has been experimenting with the Brecht canon since 1984, and while it may have been on a shoestring in the old days, it was always interesting and smart. Really smart! "The Life of Galileo” is the first of a 3-part Bertolt Brecht series Brecht in Exile. Mother Courage and Her Children (1943) and The Good Person of Szechuan (1941) will be presented over the next few seasons. The fluid stage is a large, wide space filled with tables, computers, chairs, microphones, a bowl of fruit, and two tall white flat with a handwritten series of formulae on one and notes about the play on the other. The stage indicates works in progress – the play, Galileo's theories, history itself. The many roles are performed by the four actors in epic acting style and modern dress. The play begins with two of Galileo's obsessions: science and money. Since his salary at the university will not cover his expenses, he reluctantly becomes a tutor to a wealthy student (Michael David Gordon), who tells him of a wonderful new invention that can be bought cheaply in the Dutch marketplace. Soon the sly Galileo (Joey Collins) is hawking an improved telescope to the powers that be as a spy-glass, a tool for spotting enemy ships. He, however, has other designs. He will study the heavens. As he instruct Andrea Sarti (Chantelle Guido), the clever son of the housekeeper (Terry Greiss), he instruct us on the law of gravity using an apple and a pencil. ("You can prove anything with an apple.”) In a few simple discoveries, Galileo has defied the truth of both ancient scientific belief and sociology. The earth, he argues, is not tied to the heavens on a crystal band. And it is not the center of the universe; there are multiple centers – which means lots of room – for thought, for exploration, for discovery and change. By preferring Andrea over his rich tutee, he upsets the whole social order. He opens the revered teaching of Aristotle and the Bible to scientific testing. Thus, his nemesis enters the play – the Church. Does this seem too challenging? 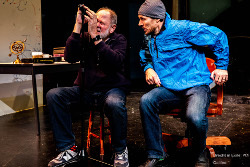 Irondale and Brecht make it highly theatrical and funny. There is a proverb slam and there are puns. Copernicus becomes Copper Knickers. The debates with church officials in Florence and later Rome are spoken into microphones. Galileo even has a hard rock number -- because he was a superstar during his life. (Original music written and performed by Sam Harmet, who is joined on stage by Erica Mancini) Galileo's discoveries were the talk of the marketplace. Ordinary people were reading about physics and astronomy. Epic acting – dramatized story telling by actors – itself is often tongue in cheek. The tall, bearded Terry Greiss plays Galileo's housekeeper by holding a duster in her hand. Chantelle Guido plays both Galileo's pious daughter, Virginia, who is dumped by her fiancé when Galileo is placed under house arrest, and Andrea, the eager male student, who sneaks Galileo's manuscript of the Discorsi past the border guards into Holland, where it is published. 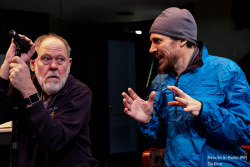 The play might well be titled "The Education of Galileo Galilei.” In spite of warnings from friends and the burning of another scientist for defying church teaching, the astronomer naively believes that his evidence is enough defense. But as he meets the opposition, he learns how little the world values truth. The new pope himself (Michael David Gordon) was a scientist but as the robes of authority are placed on him, he shakes free of the empirical to champion the church. The Little Monk tries but he cannot deny the truth of his eyes, and Galileo unsettles him further by challenging his notion that the suffering of the poor is holy. Galileo has a coterie of powerful followers but when the Inquisition shows him the instruments of torture, he publicly recants his theories. On another corner of the stage, his friends insist he will resist, and then the church bells toll. A very dramatic scene. Much praise for the pacing, innovations, and creative twists by Director Jim Niesen. All the acting was admirable, but Joey Collins took my breath away after Galileo recanted. He somehow aged 20 years, a broken man ashamed that his sly choice to keep on working had halted scientific progress completely. No one dared discuss physics or publish new papers since the great astronomer had been silenced. Virginia's heartbreak and her father's aren't just words. We witness the toll the punishments exact. In 1933 Brecht and his family fled Germany, fearing that The Third Reich would arrest him. As the Nazi army advanced he traveled east from one Scandinavian country to another, continually writing many of the masterpieces. As politics changed, he would return to the plays to create a gloss on events, to sharpen the conflicts. "The Life of Galileo” was completed in 1938, but rewritten in 1945 after Hiroshima, and again after his return to Germany in 1947.